Since running Berlin Marathon with a fever things have been quiet here. I did take another shot at a fall marathon, running Philadelphia in late November, but that race too went off the rails. Despite my hopes I was still not back at full strength. I made it to the finish line in an unmemorable time, my major consolations being twofold. First, the timing of the marathon meant that I arrived early at my sister-in-law's house for Thanksgiving, which resulted in my getting lots of time to spend with my brother-in-law who has ALS (or Motor Nueoron Disease as it is known here in the UK). We didn't do much of note (although we ended up going to see Birdman which went on to win the Oscar for Best Picture), but it was great to just spend time with him. Highlights included his introducing me to various incarnations of Dr. Who (I've always been partial to Tom Baker and hadn't previously made the effort to broaden my horizons); and us having a talk about athletic preparation and race performance (Jim swam competitively for Williams College and continued to be passionate about swimming until ALS forced him out of the pool). Post Philadelphia I have been focused on recapturing the simple love of running, and gradually returning to training. While last year my focus was on that elusive chase for a better marathon time, this year is about strength and endurance. The main difference is that this year is less about speed and managing the pain of going too fast, and more about distance and managing the pain of going too far. The primary training goal for this year is to strive for being strong enough to be able to complete a 100K race without feeling shattered at the end of it. 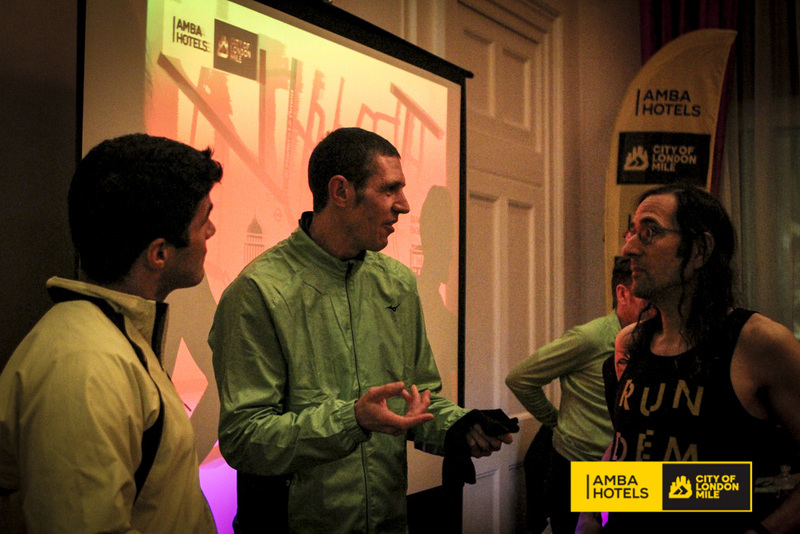 Once the presentations were done, those of us brave enough to take on the challenge were given a chance to race a mile along the Embankment with (but definitely not against) Anthony Whiteman. 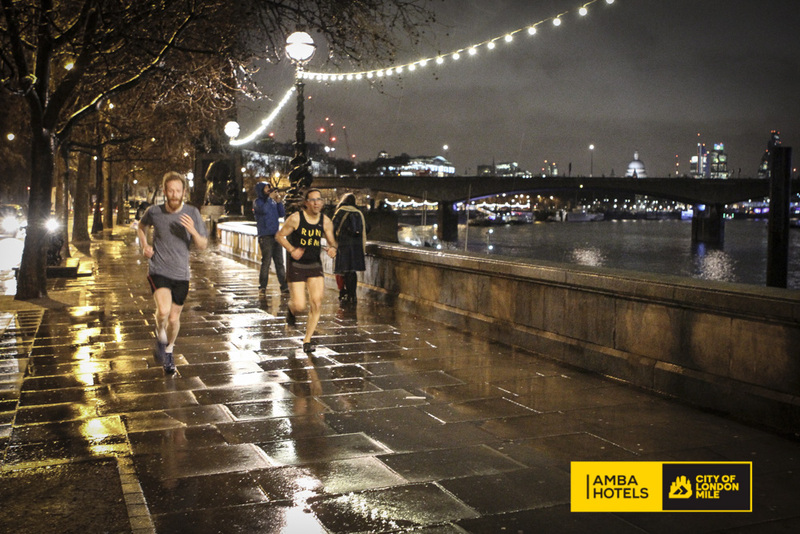 The launch event itself was cozy and warm inside the newly renovated Amba Charing Cross Hotel, which only made the walk down to the Embankment, especially for those of us in short shorts and vests, seem even colder than it was. We received a quick pre-race briefing (mostly making sure everyone knew which piece of railing underneath the Charing Cross rail bridge was the finish line), and set off to jog the course in reverse as a warm-up. 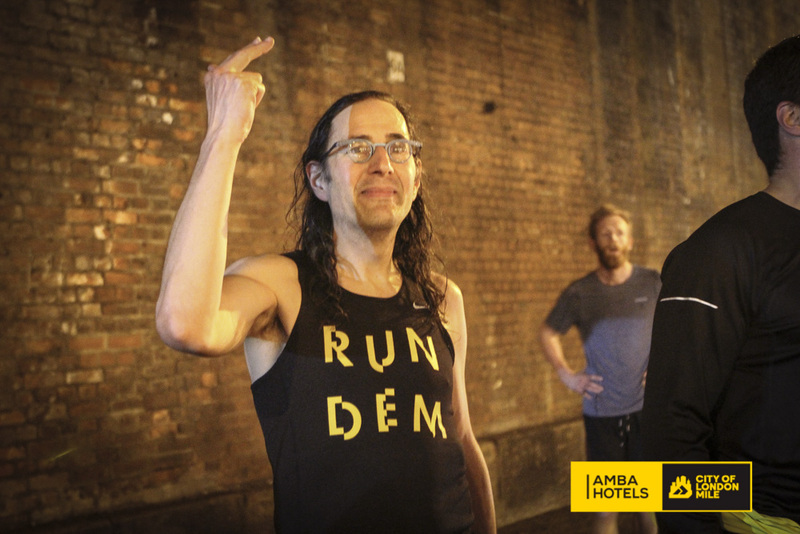 The rules were simple: everyone had given their predicted mile time to Simon Freeman, and our goal was to come as close to that time as we could. With one catch: we had to run 'naked' that is without watches or other timing devices. I had gone for a modest 7:00/mile due to the cold and wet conditions, and thought I had a sense of what running a 7:00/mile pace feels like. Once we arrived at the start we had a few minutes to mill around, and then we were off. Those wondering about logistics for timing such an event will be amused to discover that the secret was a man on a bicycle with a stopwatch! He started the watch when we set off, and then raced off ahead of us to be first to the finish line where he then called off the times as each of us crossed. I set off at what I thought was the correct pace, and just focused on maintaining that pace all the way through. Part of Mr. Whiteman's talk had been about how one prepares to run a mile, and the importance of consistent pacing for the whole distance. He said that his recommended method for determinine one's expected mile pace is to run ten 400m intervals at a track, with a short recovery between. The goal for this exercise is to run all ten laps at the same pace. If one can actually accomplish this feat, then one knows that one should be able to race a mile in roughly the time it took to run four of those laps. While I don't see myself running consistent 400m intervals any time soon, my takeaway was that I should focus on consistent pacing. In case anyone was unaware of this, when you are running hard, one mile can be an awfully long distance. And that is, really, the challenge of this race. Anyone who does any level of running should be capable of running a mile. But running a fast mile, that's a whole other matter. The usual mistake people make is to go out too fast, and half-way through realise how far they are from the finish. Which isn't to say you want to go out slow, it would be just as bad to finish feeling that you didn't give it your all. Either scenario, slowing down or speeding up, would not be what a true miler would consider a good race. Along the Embankment we flew, the pack spreading out as everyone settled into their own pace. The earlier rain lent a beautiful atmospheric feel to the run. I'm still not sure whether my familiarity with this stretch of the Embankment (I often do my speed work here) was an advantage or a disadvantage. It any case, I had a good sense of how much longer I needed to maintain my pace, focused on approaching bridges and other landmarks (and not on my body's pleas to stop running now), and cruised across the finish line right on pace at, um, 6:41. Or maybe 6:42. What? Didn't expect that. So much for that 7:00/mile pace. So much for any chance at a prize (prizes were given to those whose final time was closest to their predictions). On the plus side, I feel that I won something better than any prize: I learned that I am faster than I think I am! I'll take that. You can sign up now to find out how fast you are. The race is on June 14th, and features special waves for elites, families, youth, and wheelchair athletes. Women have the option of running in the regular City of London Mile or as part of a special all-female wave. The organizers are clearly trying to make this a race for everyone who runs. I hope to see you all there. This page contains a single entry by Daniel Maskit published on February 28, 2015 9:53 AM. Grappling with Grippe in Berlin was the previous entry in this blog. Running 'Naked' Through Paris is the next entry in this blog.